Researchers: S. Adhikari, E. R. Ivins, and E. Larour, NASA Jet Propulsion Laboratory. Greenland’s ice and snow mass has been melting at an accelerated rate for many years. 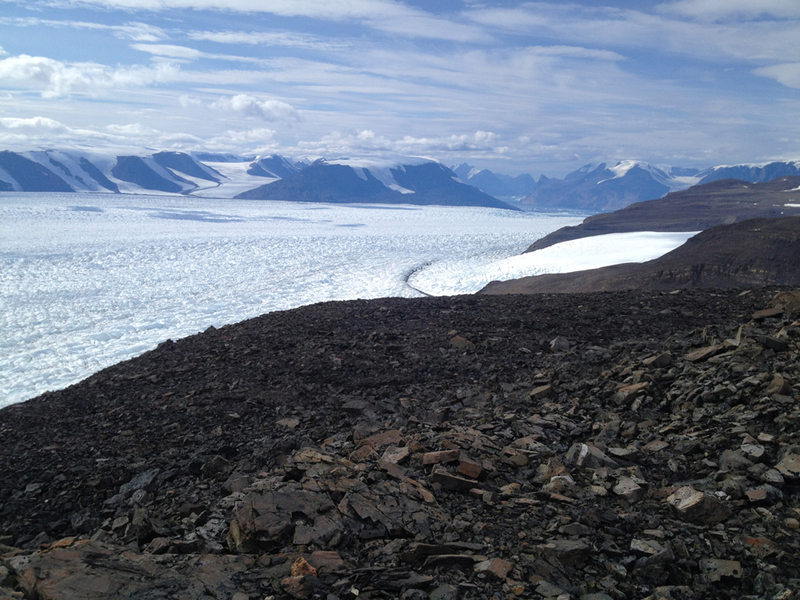 A network of GNSS sites, set-up on coastal bedrock, has been utilized to measure a huge outflow of ice and water in 2012 and 2010 -- two of the most intense Greenland melt years -- from the Rink Glacier. The horizontal motion at the Rink site captures a solitary mass transport wave traveling coastward down the glacier in the summers of those two melt years. Geodetic measurements can help determine the amount of mass transport and its influence over sea level changes. Greenland’s outlet glaciers have been observed for many years and show significant surface melting and ice flow. Much of the summer meltwater may percolate and remain hidden below the surface in underground rivers and lakes. The changing amount of mass is inferred from a single station GNSS bedrock site, combined with a suite of field and satellite observations, and detailed modeling. 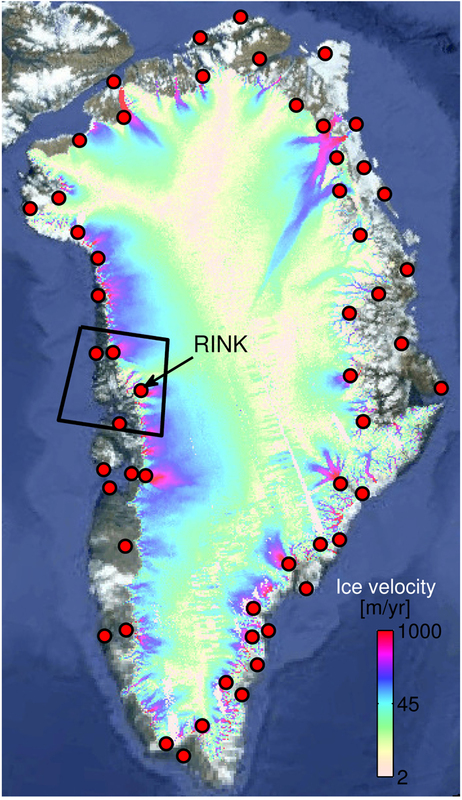 Here the authors are able to follow the mass transport of water and ice along the Rink Glacier and to the coast using a GNSS site near the glacier. 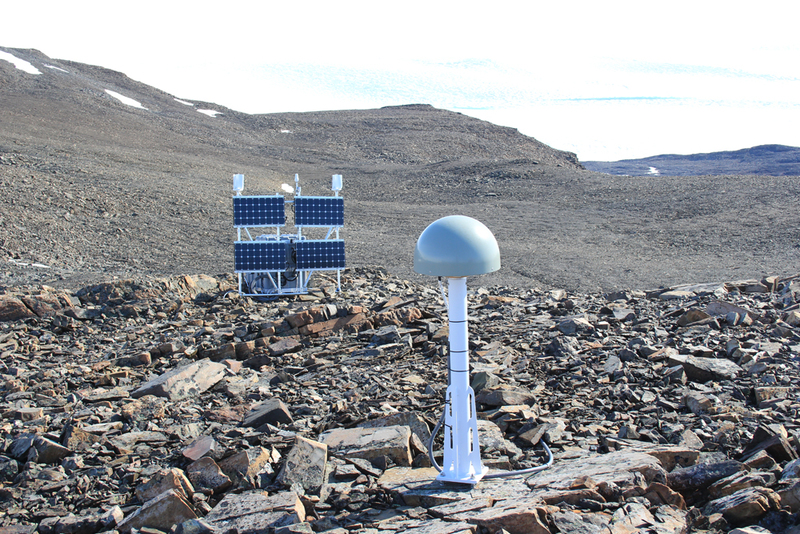 Greenland’s bedrock, which is exposed mostly near the coast, is covered with an array of more than 50 GNSS sites. 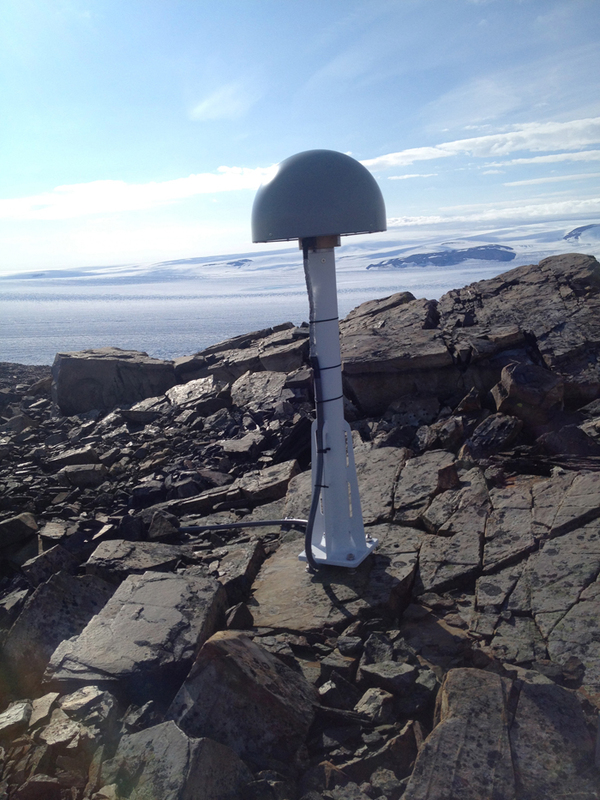 The network is called GNET and has been used primarily to measure vertical motion of the ground to determine the amount of glacial isostatic adjustment as ice mass is lost from the continent since the Last Glacial Maximum. Analysis of the vertical and horizontal changes in GNET, show a curious but systematic anomaly at the site near the Rink Glacier. 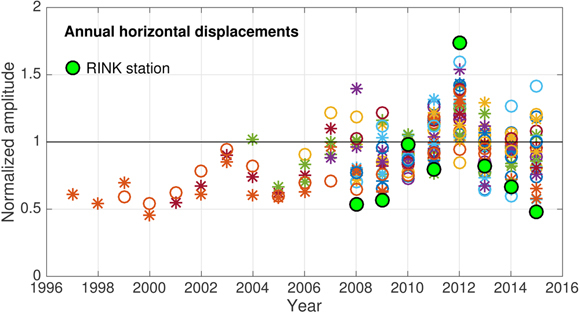 The GNSS site near the Rink Glacier showed significant horizontal motion during 2012 into 2013. The inferred amount of ice/water mass in motion is about 1.67 gigatons of ice per month for four months of the summer. This amounts to about half of the annual average discharge for all of Greenland from 2000 to 2005. The motion is attributed to a solitary wave of ice loss that travels at an average speed of 7.1 kilometers per month during the summer. The additional ice loss in 2012 in Greenland was substantial. The results show the usefulness of GNSS stations in constraining mass transport through Greenland’s fast-discharge outlets -- which would otherwise be extremely difficult to measure with existing field/satellite observational tools. 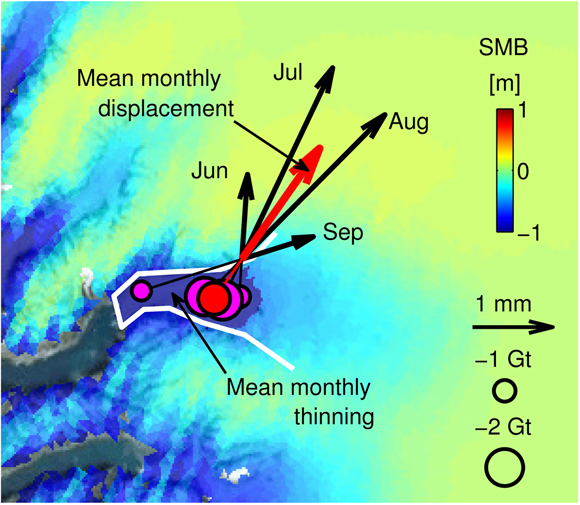 Adhikari, S., E. R. Ivins, and E. Larour (2017), Mass transport waves amplified by intense Greenland melt and detected in solid Earth deformation, Geophys. Res. Lett., 44, 4965–4975, doi:10.1002/2017GL073478.